"A spicy take on this classic side vegetable dish." In bowl whisk together egg white, cayenne and cumin. Add pecans and toss to coat. Transfer to rimmed baking sheet and bake for 10 to 12 minutes. Set aside to cool. Once cooled, chop into smaller pieces. 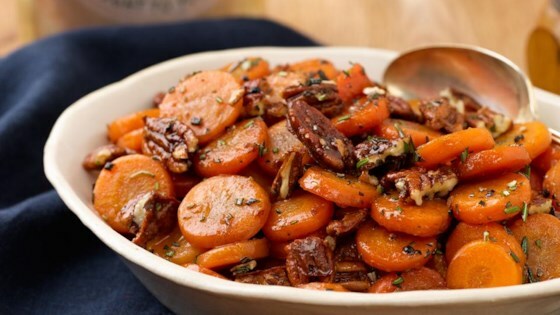 Heat skillet over medium heat and add butter, brown sugar, rosemary, and drained carrots. Add 1/4 cup of water to carrots. Cover and simmer for 8 minutes.